Jordan Zimmermann | Let Teddy Win! With playoff home field advantage wrapped up by the home town Nats, the only thing undecided going into Sunday’s regular season finale was question of who would win the 2014 presidents race championship. 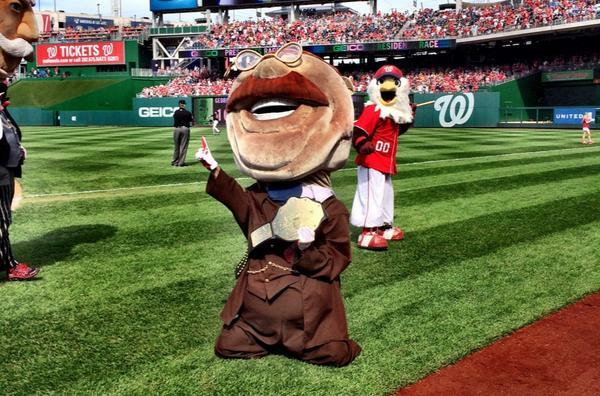 So while fans at Nationals Park expected little on-field drama, anticipation was high about the final tie-breaking dogfight between four-time champion Abraham Lincoln and perennial loser Teddy Roosevelt. What unfolded defied every fan’s expectations. 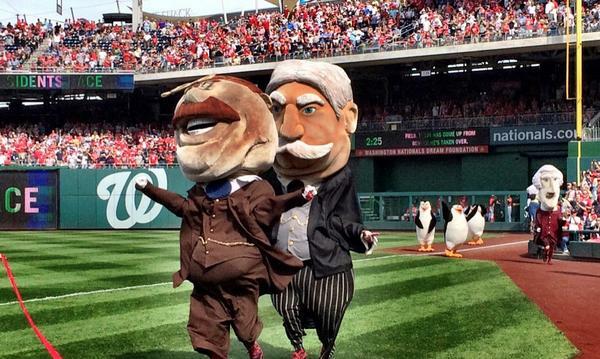 The final presidents race of the season wasn’t a dogfight at all, but rather a staged relay race featuring the racing presidents and the characters from the upcoming Dreamworks motion picture Penguins of Madagascar. 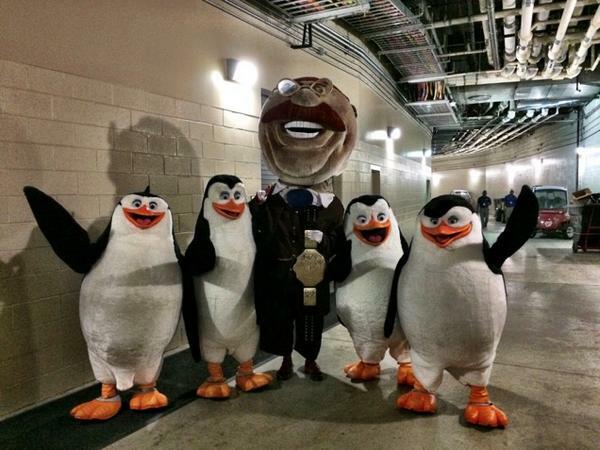 George Washington, Thomas Jefferson, Abe Lincoln, and William Howard Taft lined up in tandem with penguins Private (pushed on a cart by George), Skipper, Rico, and Kowalski. Roosevelt did not participate. Then, halfway through the race, the hero of San Juan Hill emerged from center field and darted past the relayers, passing Taft in the home stretch and running away uncontested with the presidents race title. 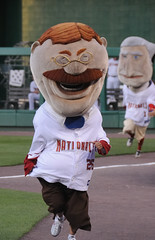 After over 600 losses, Teddy Roosevelt is now presidents race champion for the first time. The Nationals sport a record of 18-8 when Teddy wins this season (18-6 when Teddy wins in the fourth inning), a record which suggests that a few more Teddy victories in the playoffs would not be a bad idea. As always throughout the season, finish line video for LetTeddyWin.com is by the intrepid lfahome of the Gnome Garden. It wasn’t a complete invasion, but busloads of Philadelphia fans were among the 24,875 at Nationals Park Thursday night to see Cliff Lee and Jordan Zimmermann go at it in the final game of the Nationals’ series vs. the Phillies. The notorious boo-birds have earned a reputation for importing disruptive behavior to Nationals Park, and Thursday night was no exception, as the local MASN broadcast caught a spectator reaching into the field of play during the fourth-inning presidents race. The fan wasn’t wearing team gear, but can there be any doubt where he’s from? UPDATE: We’re told that Nationals Park security “swarmed” him and immediately ejected him from the park. After getting hit, Jefferson spun around but maintained his balance. Teddy Roosevelt was nearly able to take advantage and grab the victory, but he was outpaced by Abraham Lincoln in the stretch. New Washington Nationals uniforms for the 2011 season are set to be unveiled at a Nationals Park fashion show next month. Have we seen the last of Teddy Roosevelt's home racing whites? Invitations were sent out this week by the Washington Nationals for the VIP event, which will be held at the ball park on the evening of November 10. Nationals players Tyler Clippard, Ian Desmond, Ivan Rodriguez, Drew Storen, Ryan Zimmerman and Jordan Zimmermann will show off the new uniforms as part of a fashion show for invited guests. The new jerseys will be available for purchase beginning Thursday, November 11 exclusively at the Nationals Park Team Store, with players on hand to sign autographs beginning at 11:30am. It’s been two years since the team last announced new Nationals uniforms. At that time, blue alternate jerseys were introduced for the launch of the new ball park, and a script “Washington” replaced the block lettering on the team’s road uniforms. It’s been speculated that a similar change is in line for the home uniforms, with the block “Nationals” lettering disappearing in favor of script. Personally, I hope it’s not true, having been a fan of the block lettering since it was first introduced as part of the Nationals logo in November of 2004. The new threads will make a nice birthday present for racing president Teddy Roosevelt, who is set to celebrate his 152nd birthday tomorrow. The Washington Nationals have released a coupon code “for Teddy’s fans” good for half-price tickets to the series vs. the New York Mets starting on Labor Day at Nationals Park. The online code gets you half-price tickets in the outfield corners ($18), outfield mezzanine ($15), and upper infield gallery ($9). You must order at Nationals.com using Coupon Code “TEDDY”. The 3-game series features day games on both Monday and Wednesday, with Jordan Zimmermann making another start on Labor Day, and the debut of highly-touted pitcher Yuneski Maya on Tuesday night. For Monday’s game only, the Nats are also running a $1 kids ticket promotion. Buy one ticket at full price, and get additional tickets for the kids for just $1.00 each. As always, 400 Grandstand-level seats (Section 401/402) will also be available for $5.00 each at the gate before the game. No coupon required for those. After a 1/2-dozen roster moves, the signing of third baseman Ryan Zimmerman to a long-term contract, and the calling up of rookie Jordan Zimmermann for his first major league start, there was an unusual mood of cautious optimism in the air tonight at Nationals Park. With the sound of thunder booming in the distance, it seemed the perfect night for Teddy to take his first presidents race victory. It was wishful thinking. 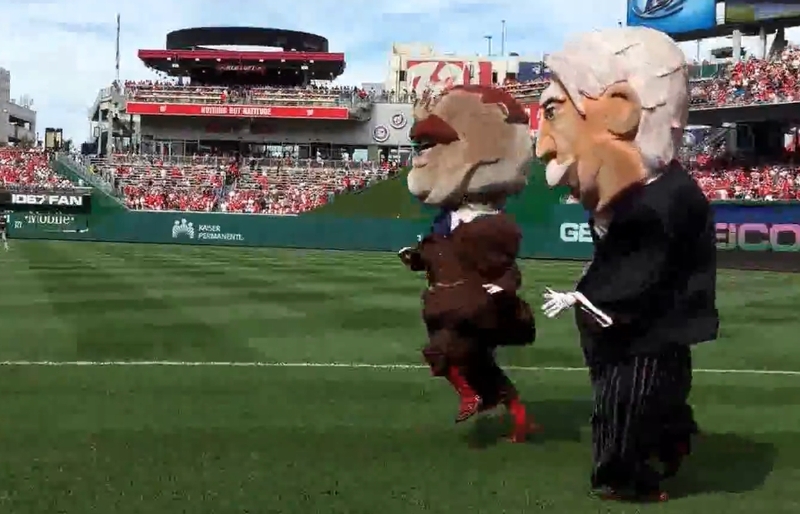 More than 3 hours after the scheduled start time for tonights game between the Washington Nationals and Atlanta Braves, the racing presidents finally took to the soggy outfield. After taking an early lead, Teddy seemed more concerned with staying dry, struggling as he ran with a comically undersized umbrella, while Abe passed him by to take the tape. Abe now has sole posession of first place in the presidents race standings. Let’s hope this isn’t a repeat of last year. Reminder: Two days left for Half price tickets for Teddy fans.